Degenerative joint disease of the spine is one of the most common claims made by Veterans for service-connected disability. That is because back injury is so common during military service. Contrast this with other conditions, such as cardiac conditions, which rarely affect young soldiers. This severe condition causes many Veterans to be unable to work. It is thus surprising that Veterans receive disability ratings of 10 to 20% for back injury, but receive much higher ratings and unemployability for conditions like depression or cardiac disease. The reason for this low rating is based on the history of disability rating. The rating dictionary was created before World War I and was based on medical science existing at that time. The VA was very resistant to updates and upgrades of its rating index. Recently, the VA added new and modern rating classifications for mental disease and cardiac diseases which conform with the newest accepted classifications by the American Medical Association, but progress in updating the ratings of common musculoskeletal ailments is slow. More recently, the VA did allow some modifications to its rating of degenerative joint disease of the back and neck. Knowledge of these subtleties involved in the rating of this condition are important for a successful and fair rating of your service-connected disability. Unfavorable ankylosis is extremely rare in clinical practice. It means that the entire spine is in flexion, and a person cannot move his spine at all. Using these ratings, which are still commonly used, will result in ratings no higher than 30%. Note that even if the Veteran is totally unemployable, he cannot file for total unemployability, because his rating is only 30%. When a Veterans’ advocate sees a rating for degenerative joint disease of the spine, he should first make sure that the rating was not based on the rating code listed above, but rather on the rating for intervertebral disc syndrome (IVDS) 5293. This relatively new classification allows a rating of 60%, which enables the Veteran to file for unemployability. It also allows for consideration of incapacitation due to pain, which is not allowed under the ankylosis classification. In addition, the advocate should explore the possibility of using the rating for nerve damage, specifically, sciatic and peroneal nerve damage. What is Intervertebral Disc Syndrome (IVDS)? IVDS is a group of signs and symptoms resulting from displacement of an intervertebral disc or disc fragments at any level of the spine. There are usually pain and other signs and symptoms at or near the site of the disc, and there may be pain referred to more remote areas, plus neurologic abnormalities due to irritation or pressure on adjacent nerves or nerve roots. IVDS may also be referred to as slipped, herniated, ruptured, disc, degenerative disc disease (DDD) or sciatica. IVDS commonly includes back pain and sciatica (pain along the course of the sciatic nerve into the buttock and the leg) in the case of lumbar disc disease, and neck plus arm or hand pain in the case of cervical disc disease. 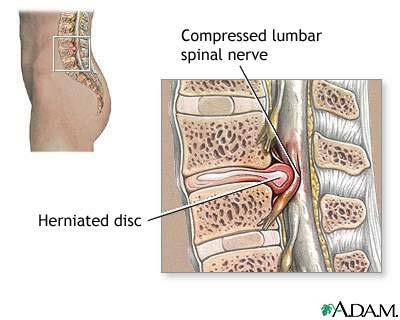 Lumbar IVDS accounts for 62% of all disc disease. All but 10% of lumbar IVDS is at the L4-L5 or L5-S1 level. Cervical IVDS accounts for 36% of all disc disease. The C6-C7 level is the most common, and the C5-C6 level the next most common level for cervical IVDS. IVDS is uncommon in the thoracic area, where the spine is less mobile. What is the pertinent anatomy for IVDS? Discs, or intervertebral discs, are named according to the number of the vertebrae above and below. Therefore, the disc between the second and third lumbar vertebrae is called the L2-L3 disc, and the disc between the fifth lumbar and first sacral vertebrae is called the L5-S1 disc. Nerve root damage from any cause is called radiculopathy. Radiculitis means inflammation of a nerve root and is sometimes used interchangeably with radiculopathy. Radicular refers to the nerve root (or radicle) of a nerve. Back pain may be the primary symptom, but pain in the distribution of the irritated or compressed nerve root may also be primary. However, some people have no back pain at all. There may also be referred pain in the buttocks, sacroiliac joints, and thighs. Referred pain is pain perceived in an area of the body that is far away from the site of pathology. May be sciatica, which is sharp, burning, or stabbing pain radiating from the low back down the posterior thigh and posterolateral lower leg, and possibly into the side of the foot. It is due to S1 or L5 radiculopathy. Pain is worse when sitting and standing than when lying down, and coughing, sneezing, bending, or heavy lifting may aggravate the pain. Sensory abnormality – The exact area of numbness or other abnormal sensations, if any, is determined by the particular nerve root affected, and may be in the inner ankle, the great toe, the heel, the outer ankle, the outer leg, or a combination. Motor abnormality – Weakness or paralysis depends on the particular nerve root affected, and may affect ankle upward or downward motion or dorsiflexion of the great toe on the affected side. Reflexes – There may be abnormal deep tendon reflexes of knee (patellar) or ankle (Achilles tendon). Pain radiating down the arm (brachialgia). The pain may be sharp, burning, stinging, or stabbing in the arm, elbow, wrist or fingers, depending on the disc site. It is the upper extremity equivalent of sciatica in the lower extremity. May be referred pain in the upper middle of the back. Headache is common. C5-C6 IVDS may include weakness of elbow flexion and wrist extension and sensory loss of lateral forearm, thumb, and lateral part of index finger. C6-C7 IVDS may include pain in the lateral forearm, thumb, and index finger; weakness of elbow and wrist extension; sensory loss of the long finger; and a decreased triceps reflex. What does the examiner look for? In order to be rated under this rating code, you will undoubtedly be required to undergo an examination by a Veterans’ Administration examiner. You should also, however, ask your treating physician to detail in his clinical examination in your medical records the pertinent findings, which will then allow your advocate to claim that the examination by the VA personnel was inadequate. Straight leg raising (SLR) is a test is done by gently lifting the relaxed, extended lower extremity to approximately 90 degrees, with the patient lying supine. This stretches the sciatic nerve and reproduces sciatic pain. The normal limit without pain when there is no sciatic nerve abnormality is between 60 and 120 degrees, depending on the patients age, habitus, and physical condition. The amount of pain-free flexion is less important than variation between the legs. SLR, while sensitive, is non-specific because it may be limited or painful because of tight hamstring muscles, sacro-iliac joint pathology, or radiculitis. Lasegues sign is worsening of the pain in an SLR test by dorsiflexing the foot. The hallmark is pain. This may be associated with abnormal sensations (paresthesias) such as tingling or increased sensitivity, or with sensory loss in a dermatomal distribution. There may be weakness of muscles innervated by the nerve root. Superficial (skin) tenderness on light palpation. Positive when the skin is tender to light touch. Nonanatomic pain or tenderness. Positive when there is pain or tenderness extending over a wider area than that expected from the nerve pinched. Axial loading that increases pain. Positive if pressing down on the top of the head of a standing patient produces low back pain. Positive if passive rotation of shoulders and pelvis to 30 degrees in a standing position causes back pain. Distracted straight-leg raise. Patient may complain of pain or limitation of motion in a normal SLR test, but not when examiner extends the knee with the patient seated, while examining the foot, etc. Such inconsistency is a positive sign. Regional sensory change. Positive if does not correspond to a neuroanatomic or dermatomal distribution, e.g., stocking or global distribution of numbness. Regional weakness. With true muscle weakness, there should be a smooth, non-jerky motion when range of motion is resisted. Positive if there is a sudden letting go of the muscle with cogwheeling, give-way, or breakaway weakness. Overreaction. Positive if there is inconsistent hypersensitivity to light touch or an exaggerated, nonreproducible response, such as excessive grimacing, tremors, etc. But cultural and individual differences, as well as observer bias, must be taken into consideration. McBrides test: Patient stands on one leg while raising the opposite knee to the chest. Because the knee is bent, no sciatic stretch occurs, and the spine is flexed, which removes pressure, so this should lessen low back pain. A reported increase in pain, or a refusal to do the test, is a positive sign. Burns test: Patient is asked to kneel on a chair and touch the floor. Since the knees are bent, patients with true back pain or sciatica should be able to do the test without much difficulty. Those with nonorganic back pain usually cannot. a. Clinical findings are always a significant factor in diagnosis because neurodiagnostic imaging studies show positive findings in at least one-third of patients who are free of symptoms. b. X rays: Can demonstrate bony alignment and may show decreased disc height, but do not show a disc fragment compressing a nerve. Have limited value because degenerative changes are age-related and are equally present in asymptomatic and symptomatic persons. However, they help rule out tumors, infections, and fractures. d. Computed Tomography/Myelogram (CT Myelogram): A myelogram is an x-ray taken after contrast material is injected into the spinal canal to outline the spinal cord and nerves. Herniated disc fragments or bone spurs compressing the nerves are well visualized, but it is inferior to MRI in soft tissue detail. Largely replaced by MRI, which does not require injection. e. Electromyogram and Nerve Conduction Studies (EMG/NCS): Done in selected cases to assess function of a compressed nerve. f. Discography: Injection of contrast material directly into a disc. Usually done with CT. Most patients recover within four weeks of onset of symptoms, regardless of type of treatment. Sciatica resolves in 75% of patients within six months. When conservative therapy fails (which occurs in about 10%), surgery may be needed. •Laminectomy: traditional surgery performed for lumbar IVDS to relieve pressure on one or more nerve roots. The posterior arch of the spine (lamina) is removed to create more space for the nerve root, in order to relieve compression. Part of the disc may be removed, as may bony spurs and scar tissue. •Laminotomy: newer, less invasive type of surgery for lumbar IVDS, in which only the small area of the lamina directly surrounding the affected disk, instead of the whole back of the lamina, is removed. This keeps the spine more stable. •Anterior cervical decompression, with or without fusion: surgery for cervical IVDS, in which the disc material is removed and the spine may be fused at the level of the abnormal disc. After successful surgery, 80-85% of patients do extremely well and are able to return to work in about six weeks. Small areas of leg numbness may remain. Mild flare-ups of sciatic type pain occasionally develop. IVDS can be rated in two ways. One is to look for the extent of incapacitated episodes. The other is to look for objective signs and symptoms of IVDS, specifically nerve or orthopedic damage. The Veterans’ Administration will allow you only the highest rating of the two and does not allow combining of the two to get a higher rating. •and at 10% if there are incapacitating episodes of at least one but less than two weeks total duration during the past 12 months. b. IVDS that is disabling primarily because of chronic orthopedic manifestations (e.g., painful muscle spasm or limitation of motion), chronic neurologic manifestations (e.g., footdrop, muscle weakness or atrophy, or sensory loss), or a combination of both, is evaluated by assigning separate evaluations for the orthopedic and neurologic manifestations, using diagnostic code 5293 hyphenated with the appropriate orthopedic (musculoskeletal) or neurologic code. c. When IVDS is disabling both because of incapacitating episodes and persistent orthopedic or neurologic manifestations, whichever alternative method of evaluation results in a higher evaluation is used. d. The great majority of cases will be more favorably evaluated under the method in b. •Calculate the percentage evaluation based on the cumulative amount of time over the course of the past 12 months that the patient is incapacitated, and combine with the evaluation for all other service-connected disabilities. •Calculate the percentage evaluation based on the orthopedic and neurologic manifestations, and combine with the evaluation for all other service-connected disabilities. •Compare the two overall evaluations, and assign an evaluation for IVDS based on the method that results in the higher evaluation. “6. How is IVDS treated? The advocate should argue, therefore, when a Veteran’s back pain was so severe that it required physical therapy, enhanced drugs including narcotics, and multiple visits to physicians and healthcare providers, that the time expended in using these modalities should be equivalent to the bedrest used in the regulation to prove incapacitation. At this point, neither the BVA nor the courts have accepted such arguments, but I believe that pressure from Veterans and advocates taking this approach will eventually result in acceptance. Meanwhile the Veteran is instructed to report bedrest to his physician and to keep a diary as evidence. Calculation of bedrest is cumulative. Veteran does not need a continuous 6 weeks of bedrest. If the degenerative joint disease of the spine resulted in orthopedic or neurological damage, and if the rating for neurological damage exceeds the rating one can get for proving incapacitation, the advocate should look at the rating of nerve damage to the sciatic or peroneal nerve. •Made up of nerve roots L4, L5, S1, S2, and S3. •Supplies the muscles of the back of the knee and lower leg and sensation to the back of the thigh, part of the lower leg, and the sole of the foot. •Incomplete damage may appear identical to damage to one of its branches (tibial or common peroneal nerve). •Sensory abnormalities may include sensory changes of the back of the calf or the sole of the foot, such as numbness, tingling, burning, pins and needles sensation, other abnormal sensations, and any level of pain up to excruciating pain. •Motor loss may include weakness of the knee or foot leading to difficulty walking, weakness or loss of knee flexion, and weakness or loss of foot inversion and plantar flexion. •Reflexes may be abnormal, with weak or absent ankle-jerk reflex. •Derived from nerve roots L4, L5, S1, and S2. •Sensory abnormalities may be loss of sensation, numbness, or tingling of the anterolateral lower leg and dorsum of foot & toes. •Motor loss may include weakness or loss of dorsiflexion and eversion of foot, loss of extension of toes, and possibly footdrop. How do the new evaluation criteria for IVDS compare to the old ones? The former evaluation criteria for IVDS (DC 5293) included a 60% evaluation for persistent sciatic neuropathy or other neurologic findings, with little intermittent relief; a 40% evaluation for severe recurring attacks; a 20% evaluation for moderate recurring attacks; a 10% evaluation for a mild condition; and a zero% evaluation for the postoperative, cured condition. These required a subjective determination as to whether the condition is mild, moderate, or severe and raised questions as to when a 60% evaluation was warranted on the basis of neurologic manifestations. There was also uncertainty about whether IVDS with neurologic manifestations could be evaluated higher or lower than 60%. This subjectivity has been removed. Alternative criteria allow evaluation under the method most beneficial to the Veteran, and the revised criteria can all be applied to either the pre-operative or post-operative state. Some raters have overevaluated IVDS by assigning 60% under diagnostic code 5293, and a separate 40% or 60% for sciatic or common peroneal nerve dysfunction, based in part on the same signs and symptoms. This represents pyramiding (per 4.14), since some of the same signs and symptoms (leg or foot weakness or sensory loss) were used to support two separate evaluations. The revised evaluation criteria, where the (orthopedic) neck or back problems and the (neurologic) sensory or motor abnormalities remote from the disc site are evaluated separately, should eliminate this problem. The analysis of the appropriate rating is based on Bierman v. Brown, No. 92-1444, 1993. 38 C.F.R. § 4.71a, DC 5293 (1993). The condition embodied in a rating under [Diagnostic Code] 7800 is entirely cosmetic in nature. Such rating does not contain any component of pain or muscle damage. The critical element is that none of the symptomatology for any one of these three conditions is duplicative of or overlapping with the symptomatology of the other two conditions. Appellant’s symptomatology is distinct and separate…Thus, as a matter of law, appellant is entitled to combine his 10% rating for disfigurement under [Diagnostic Code] 7800 with an additional 10% rating for tender and painful scars under [Diagnostic Code 7804] and a third 10% rating for facial muscle injury interfering with mastication under [Diagnostic Code] 5325. In addition, Veteran is entitled to a 40% rating for incomplete paralysis of the sciatic nerve, and a 20% rating for incomplete paralysis of the peroneal nerve, as the radiculopathies are secondary to his service-connected lumbosacral condition.